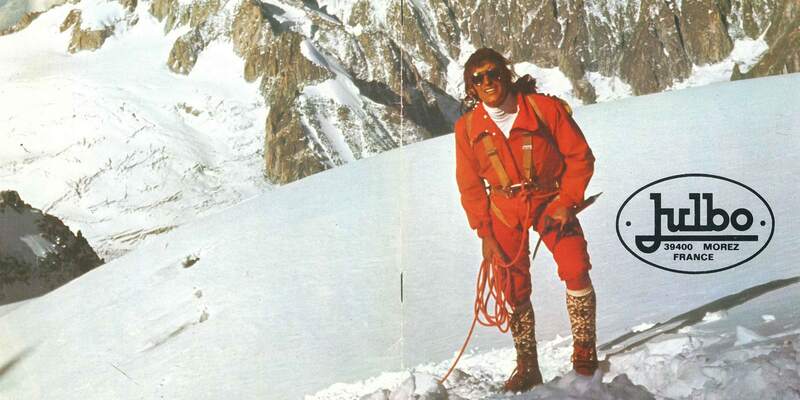 Yannick Seigneur was the first Frenchman to climb three 8000s (peaks over 8000m). He's considered to be one of the most talented guides of his generation. His career was given a boost when he crossed paths with the French climber Lionel Terray very early on. Yannick spent his childhood in Paris, where his parents worked, and Megève in the Alps where his farming grandparents lived. During his time in Haute-Savoie he learned how to look after sheep. He later returned to Lyon to continue his studies at INSA, an engineering university. 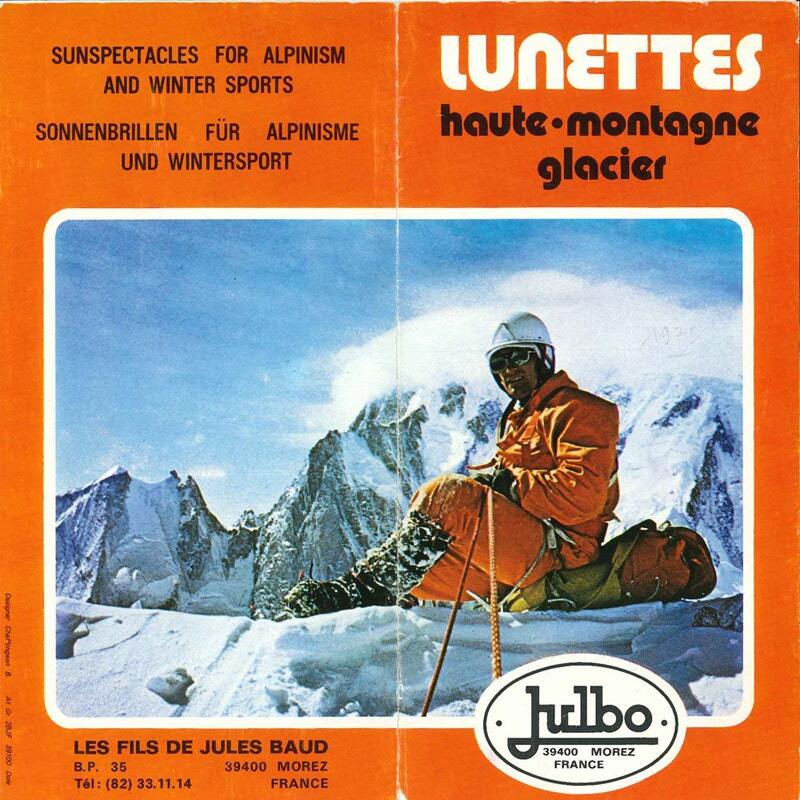 During that period he discovered climbing, spending weekends on the rocks and cliffs of the Vercors and Chartreuse (mountain ranges near Grenoble). These student adventures developed his appetite for the mountains. He decided to train as a mountain guide alongside his studies, against his parents wishes. Because of pressure from his parents, and an awareness that it would be hard to earn a living from mountaineering, he was reluctant to devote himself fully to it. He began his career working for Pomagalski (cable car manufacturers) and Rossignol (who make alpine sports equipment). It's unlikely this was by chance. He was, however, still undecided on which path to take. Yannick finally broke free in 1965 and left the office job. He still, however, kept one foot in the door by becoming a technical adviser for several different brands. It is here our paths met. 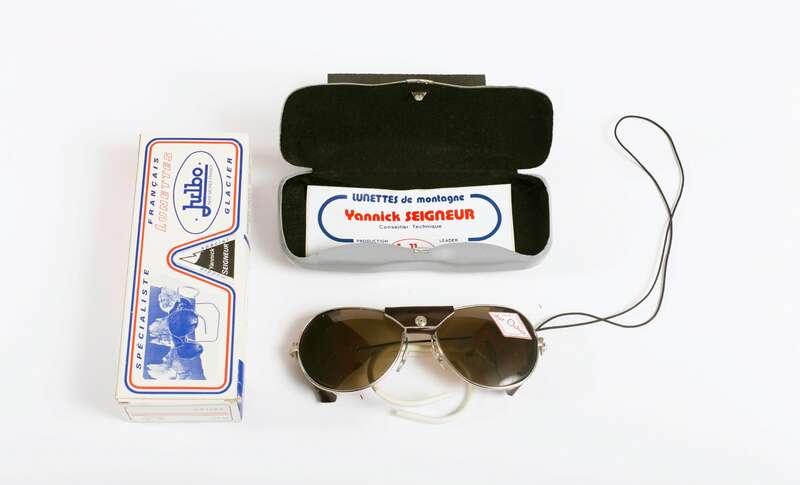 Yannick became a key developer and tester for Julbo. 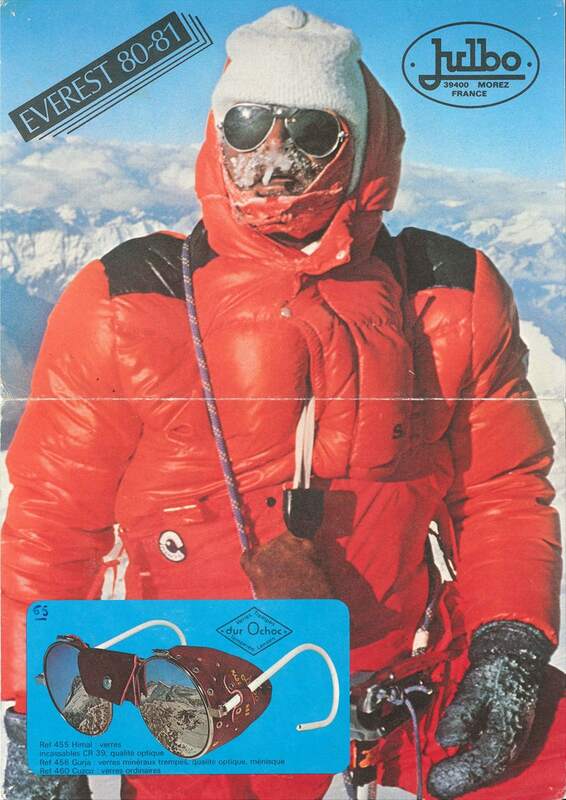 In 1971, he was the first person to climb Makalu by the west pillar. This ascent is undoubtedly one of his biggest exploits. He returned many times to the Himalayas to lead expeditions. Among other things, he scaled Everest in 1980. But what interested Yannick, and what made him special, was the fact he chose such tricky routes and insisted on climbing in alpine style. It was out of the question for him to take the usual route up or to climb a peak in order to tick a box. According to testimonies from his customers and rope team members, Yannick did not wish to become "a taxi service". Yannick took people beyond their comfort zone and pushed them forward in their goals. He was described as a free, independent, happy man who took his career very seriously. These booklets, below, from that time show our "pro model", which was a product of our collaboration with him. 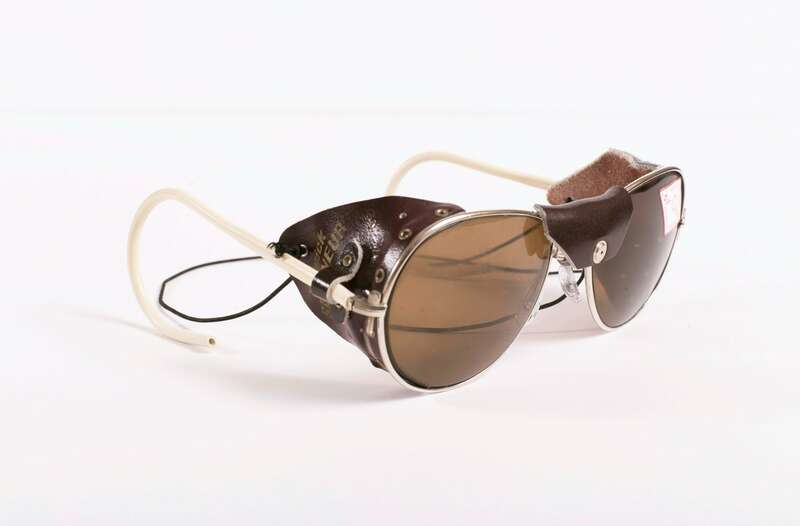 The round glasses you have seen Lionel Terray wearing were made larger, providing increased cover for the eyes. 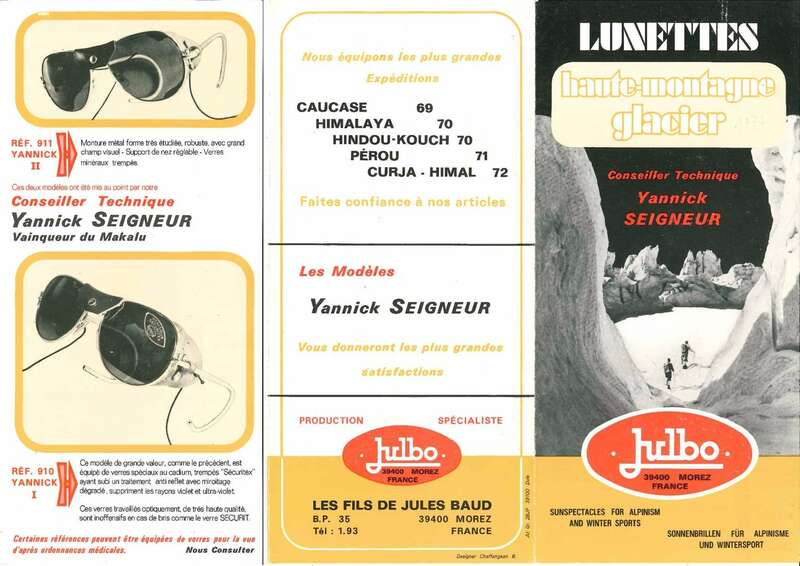 The adjustable nose support was a first in the Julbo glacier glasses range. The glass was mirrored to provide enhanced protection, especially in cases of high glare (such as snowy and icy conditions and at high altitude). It was also reworked to prevent image distortion. These design features may seem unremarkable today, but at the time they were relatively new. 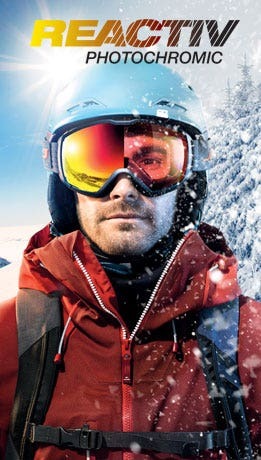 In order for adequate protection to be designed, humans had to tackle the mountains head on and discover all the ways they could cause damage to the eyesight (for example snow blindness, erythropia and white-out syndrome). And the fact that we equipped the biggest expeditions of the time meant we were getting invaluable feedback from those out in the field. 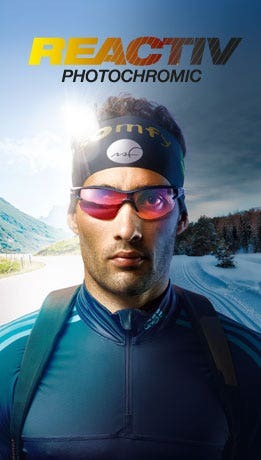 Julbo has a history of exciting collaborations with athletes, and Yannick Seigneur was the first.